This rugged, compact unit is ideal for all drain cameras and emits a 33kHz signal which can be picked up by a standard cable locator. The Clamp Sonde is easy to attach and transferrable between cameras. 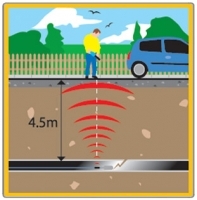 You can locate and determine the depth of your sewer or pipe inspection camera. When attached to a camera system and inserted into a drain, sewer or pipe, the signal transmitted from the Clamp Sonde can be located using any standard cable locator. This is useful in locating blockages and obstructions in non-metallic pipes. Using only a screwdriver the Scanprobe Sonde can be attached to any cable up to 12mm diameter in seconds. Measuring only 40mm in diameter and 95mm in length the EZiSYSTEM Clamp Sonde is designed specifically for the most restrictive environments. Built to be fully submerged it can be attached to almost any equipment in the harshest environments. Powered by a single standard AAA battery you can typically expect up to12 hours of continuous use. The battery can be replaced quickly and easily without having to detach the unit from the cable. 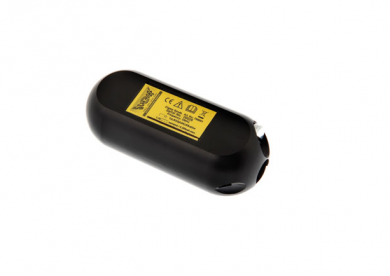 Other sondes offer nothing in the way of user feedback – it is often difficult to tell whether they are switched on and transmitting a signal! As with all EZiSYSTEM sondes the Clamp Sonde has a bright LED to show the battery is OK, inserted correctly and the unit is functioning.